(empo-tymshft) What comes after Wal-Mart? I should have packed myself! Dr. Verena Kain is NOT the LHC terrorist - whew! 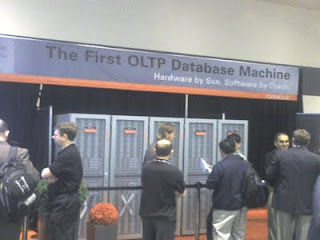 Upward mobility at #oow09 ? Where does innovative thinking take place? I was reading my Facebook during lunch, and one of my Facebook friends (I won't mention the friend's name, but the friend knows a lot about Facebook) happened to make a comment about Twitter lists. The friend started off by saying, "Someone brought up an interesting question today..." but the friend didn't name who the "someone" was. This is understandable. I myself probably read from hundreds of sources every day, and this friend may read from thousands of sources. And with all of that information pouring in, sometimes it's hard to remember who said what. Luckily, at the time that I read my friend's comment, I had just finished reading this blog post by Mark Trapp, and even with my declining memory skills, I was still able within a five-minute interval to remember who wrote the post in question. Meanwhile, my friend was searching FriendFeed, and ran across a FriendFeed entry, also by Mark Trapp, that touched on the same topic. Now in this case the same tools that helped to create this information glut also helped us to pinpoint the source of the information. Crowdsourcing and a simple search can sometimes do wonders. Unlike Robert Scoble, and like Mark "Rizzn" Hopkins, I continue to read items in Google Reader; it's probably still my primary source for information. 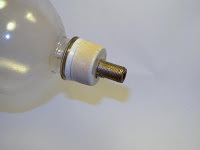 Often I'll see an item, and I'll decide to write a blog post about it, because I'm sure I blogged about the item before. So then I search my Empoprises blogs and some of my older blogs, and discover that I didn't blog about the item before. Well, maybe I shared it in FriendFeed. Strike that. Now if I read it on someone else's FriendFeed, or maybe just saw it in Google Reader and didn't do anything with it, it is for all intents and purposes impossible to find the original item. The reason that I mention this is that perhaps a day from now, or a month from now, you may ask yourself, "Who was the blogger who wrote about trying to find things in the wave of information that we all receive"? It never occurred to me that I could have a combined "empo-tymshft"/"empo-tuulwey" post. For those of you who don't following my obscure labeling strategies, posts with the "empo-tymshft" label deal with the passage of time, and how things may change over time. Or how they don't change - in a recent post, I compared cloud initiatives with half-century old time-sharing services. Posts with the "empo-tuulwey" label are dedicated to my oft-repeated maxim "a tool is not a way of life," which tries to distinguish between the specific tool, and the uses to which the tool (or an equal or better tool) is put. For example, using a carrier pigeon for communications. And, as some of you know, I work in the biometrics industry, and while I don't specifically work with DNA, I maintain a professional interest in it, especially since the NAS report blessed it as scientific (although others claim that there is a qualtative human element to DNA analysis). So this Australian story about someone who was caught via DNA analysis wasn't in and of itself all that spectacular, except for the source of the DNA. Crown prosecutor John Ransom told the Supreme Court that senior constable Nathan Slater had picked up a leech from near a safe at the scene of the crime. A DNA sample was taken from the blood in the leech by Forensic Science Services Tasmania. Yes - the DNA was taken from a leech. Yup, a leech, that animal that was used for medical purposes a few centuries ago and was subsequently reviled as unscientific and barbaric. Two words: George Washington. But the leech can be used for other purposes, it appears. While draining blood from an ex-President's body might not be the best use of a leech, the fact that the leech apparently stores the blood provides us with some scientific value. But what if it was the leech, rather than Peter Alec Cannon, who actually committed the robbery? Perhaps the DNA test matched the leech. In many cases, scaling out (by launching additional instances) is the best way to bring additional CPU processing power and memory to bear on a problem, while also distributing network traffic across multiple NICs (Network Interface Controllers). Certain workloads, however, are better supported by scaling up with a more capacious instance. Examples of these workloads include commercial and open source relational databases, mid-tier caches such as memcache, and media rendering. To enable further scaling up for these workloads, we are introducing a new family of memory-heavy EC2 instances with the Double and Quadruple Extra Large High-Memory instance types. But by far the primary hoopla was over another Amazon initiative. Today I'd like to tell you about our newest service, the Amazon Relational Database Service, or Amazon RDS for short. Now in beta, RDS makes it easier for you to set up, operate, and scale a relational database in the cloud. You get direct database access without worrying about infrastructure provisioning, software maintenance, or common database management tasks. Using the RDS APIs or the command-line tools, you can access the full capabilities of a complete, self-contained MySQL 5.1 database instance in a matter of minutes. For slightly more than a base instance, 0.11/hour RDS vs 0.10/hour base EC2 (this price is dropping 15% BTW) on a small server, you get a complete server with MySQL installed. You can create and manage your database instances via procedural call (the API) and you can scale to larger instances or additional storage fairly painlessly by also using those APIs. You also pay extra for your storage of course. Or, in other words, you use your computer as a terminal to get to an Amazon computer, and you buy some time on it. The Amazon computer is shared with a number of other users, effectively giving you a "time slice" on the Amazon computer. I think some of my readers know where I'm going with this. The Benevolent Model, in which a central service provides everything that the users need, including programs and processing power. All the user needs is a dumb terminal, something that acts as a dumb terminal, or something even dumber like a punch card reader. The central service takes care of everything for you. There is nothing to worry about. Dave? The Rugged Individualist Model, in which a computer user doesn't need anybody else to do anything. 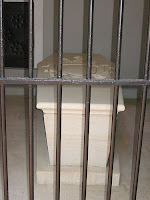 A single computer, in the possession of the computer user him/herself, includes all of the power that the user needs. We don't need no central service; we don't need no thought control. Now obviously these are the extremes, and there have been some computer trends (like client/server) that somehow combine the two. But it still seems like we alternate between the two models, and now the cloud computing model has us all leaning a little more toward the centralized model. To put this model in historical perspective, let's take a look at a company that no longer exists - CompuServe. But let's look way back in CompuServe's history. Initially, CompuServe sold its excess computer capacity to other corporations, but in 1978 it began providing services to the owners of personal computers. The goal was to squeeze profits out of underutilized assets by putting Wilkins' time-sharing computers to greater use at night, when they were frequently idle. So Amazon is merely providing some new bells and whistles on a model that's been around for a half century. In the broadest sense, the question isn't about the bells and whistles, but what types of things people want to offload from their computers to the Benevolent Server in another location. Which raises the question - what will people doing in "the cloud" (or whatever we call it) ten years from now? Back in January, I wrote a post that I've revisited several times since. The original post, entitled "Why Harlan Koch needs to run Starbucks," argued that passion is a good thing. The post cited two people whose passion bordered on insanity, one of whom was "Colonel" Harlan Sanders of Kentucky Fried Chicken fame. Perhaps you've heard of Harlan Sanders, better known as Colonel Sanders. He opened a cafe in 1929, created his special fried chicken recipe in 1939, and was considered synonymous with his fried chicken recipe until his death in 1980. Actually, even afterwards, but the post-1980 cartoon character can't compare with the real thing. Basically the corporate automatons at Kentucky Fried Chicken - whoops, I mean KFC - turned the Colonel from an insane guardian of a secret recipe to an old man in a white suit who smiled a lot. But perhaps the insanity is coming back, at least from the marketing folks. Kim LaCapria tells what happened. Actor Robert Thompson, dressed as the iconic Colonel Sanders, got as far as posing for a picture with President of the UN General Assembly Ali Treki, before his presence was detected and he was ejected from the area. The incident ended up being raised in an October 26 United Nations briefing. After answering questions about such inconsequential items as Israel and Afghanistan, the UN spokesperson addressed the...um..meat of the matter. Spokesperson: Yes, what about it? Question: The person who came and took all these pictures and all that. Spokesperson: Yes. Well, we are still trying to find out exactly what happened. It was a very unfortunate incident of someone trying to use the UN for commercial purposes, which is something we have always condemned and that we do not accept. In this specific case, there was some lapse in security and, as you know, the individual in question was escorted to the regular visitors’ entrance. He came into the regular visitors’ entrance and he was then on the initiative of one security guard, was taken a little beyond that limit, which is the limit for visitors, into the UN and he came to the second floor, which was a very unfortunate thing. It did happen. I’m not saying the contrary. It should not have happened. That I will stress very strongly. Question: He breached security with the help of a security guard. Is that right? Spokesperson: He was escorted by a security guard. Spokesperson: I can tell you that the Secretary-General never received that letter. Spokesperson: And, at any rate, that letter is void to us. It has absolutely no meaning whatsoever. The UN cannot be involved in a commercial venture, period. Question: But then, so what are the repercussions for Yum Brands or KFC for having kind of used the UN somewhat effectively to advertise themselves. Spokesperson: Well this is being, being touched upon by our legal department. Yes. Question: And what happened to the security guard in question? Spokesperson: I have asked. I don’t have the answer yet. Okay. Thank you all. Now, the original Harlan Sanders may have done some weird things, including the entire claim to be a "Colonel" in the first place, but to my knowledge he never tried to crash the headquarters of a multi-national organization. But then again, the original Harlan Sanders never tried to hawk GRILLED chicken either. And new products call for new thinking. Yes, you'd think that the new owners would want to retain the existing expertise, but the government doesn't work that way. A Congressperson's prime goal in life is not to make AIG financially viable. A Congressperon's goal in life is to get re-elected. And if the only way to get re-elected is to screw the employees of the firm you are managing, then so be it. Then we had the recent brouhaha over limitations on executive compensation. I didn't blog about it, but I shared an item from Outside the Beltway that noted that nearly half of the executive staff at AIG and Bank of America were still around when Kenneth Feinberg, the U.S. Treasury Department's "pay czar," formally imposed pay limitations for firms receiving U.S. government money. The thought is that the other half would now flee. Whether they would truly flee or not, there's certainly a theoretical argument that can be made that this is yet one more reason for employees at government-controlled firms to seek their fortunes elsewhere. But are there firms who are truly salivating at the chance to get AIG employees? Presumably all of the really good employees are already gone. Now, Mr. Greenberg may have received some unintended assistance from the United States Treasury. Just last week, the Treasury severely limited pay at A.I.G. and other companies that were bailed out by taxpayers. That may hasten the exodus of A.I.G.’s talent, sending more refugees into Mr. Greenberg’s arms, since C. V. Starr is free to pay whatever it wants. "At this point, one of the chief barriers to the recovery of AIG is the lack of accumulated financial expertise at the company. Because of the departures of key employees over the last few months, and the prospect of losing other key employees in the future, AIG's continued viability is not assured." Should someone catch this piece of fine print, then the Franks, Grassleys, and Rangels of the world will then begin to harrass Edward Liddy, asking him why he didn't do anything to retain key employees. Unless Liddy himself has departed too, to return to enjoying his well-deserved retirement. Heck, if I had been before that committee, I would have resigned from AIG then and there. - Selling to and servicing clients. - Building client relationships to provide your clients with products such as annuities, mutual funds, life insurance and long term care insurance. - Superb prospecting, advertising and sales promotion support including: colorful eye-catching sales literature, a comprehensive series of financial planning workshops, and customized direct marketing literature and letters. - The power of computer-based programs and services to support your sales effort. - State-of-the-art notebook computers and printers that will let you provide innovative retirement planning and asset allocation services for your clients, wherever they are. - Benefits package including group medical and dental, life, healthcare and dependent care reimbursement accounts, free group life insurance, employee stock purchase plan, a generous 401(k) plan with company matching contributions, and more. We are committed to creating opportunities for VALIC financial professionals, rewarding performance, and partnering with you to take stock in your future. Income sources can include training allowances, commissions, asset-based compensation or a combination of these components. - Bachelor's degree or equivalent related work experience. - Ability to quickly learn and market a variety of financial products and services. - Effectively utilizing technology for sales presentations and account servicing. Financial Advisors typically set their own schedules and work 40 or more hours a week. The hours you work, which can be flexible, depend on the number of clients serviced, the amount of time spent servicing each client and the time involved in managing client investments. The flexibility to work some scheduled evening and weekend hours is essential in providing high-quality service for customers who prefer evening or weekend appointments. Financial Advisors are ultimately commission-based. Training allowances are available for new FAs under appropriate circumstances. The compensation package for advisors and managers is very competitive, with no ceiling on earning potential. The exact amount of travel depends on the assigned territory and client base. As we move forward, client-servicing tools are increasingly accessed through technology; however, face-to-face service is also an important part of servicing clients and is frequently required. Occasional travel for training, group enrollments, or regional meetings may also be required. Retirement Services serves more than five million customers with retirement savings products and services through its vast distribution network of registered representatives, independent broker-dealers, national and regional securities firms, banks and insurance agencies. Advisor Group, Inc., one of the largest independent broker-dealer networks in the United States and consists of FSC Securities Corporation, SagePoint Financial, Inc. and Royal Alliance. SunAmerica Affordable Housing Partners, Inc. (SAAHP), one of the nation's leading investors in low-income housing tax credit transactions and the fifth largest apartment investor in the nation. SunAmerica Asset Management Corp., a mutual fund and asset management business. SunAmerica Retirement Markets, Inc., specializing in marketing and distributing retirement savings products through an extensive national network of registered representatives at independent broker-dealers, securities firms and banks. VALIC, who, for more than half a century, has served as a leading plan provider for K-12 schools and school districts, as well as for higher education and healthcare institutions. Western National Life Insurance Company, the largest issuer of fixed annuities in the United States and the leading provider of annuities sold through financial institutions. That job listing was posted more than two months ago, on August 20. I suspect that executive-level positions take a little longer to fill. This was buried in a comment on a Mashable post. We used to be able to get everything but then they suddenly banned everything social networking related without any kind of warning. One day it worked the next it didn't. I guess a lot of people complained because about a week later they brought it back, but just between 12 and 2 when people are usually on lunch. The CEO even started a Facebook company page which was odd seeing as we can't get on it at work. No ones going to bother going onto it in their free time.. Seems like he is contradicting himself. Business history over the last 100+ years has consisted of a predictable cycle. A business is established. A new business comes along that cheats and steals and does unfair things, knocking the old business from the top of the heap. Then everyone loves the new business, and gets irritated when an even newer business emerges to threaten the new status quo. Those who complain about Wal-Mart today and talk about the virtues of the regular supermarkets were probably not around when people were complaining about how the regular supermarkets were destroying A&P, which in turn was the subject of derision when it wiped out the local butcher and baker and candlestick maker. Wal-Mart is just the latest in the cycle, and while it has demonstrated some staying power, it won't stay around forever. General Motors certainly didn't stay around forever. Microsoft has seemed to stay around forever, but it appears to be an exception to the rule - so far. So who will have us longing for the good old days of Wal-Mart? One candidate has emerged in France, and BusinessWeek talked about it. And it's not Carrefour. Over the past decade, Auchan (pronounced oh-shon) has expanded rapidly into China, Russia, and Eastern Europe. Based near the northern French city of Lille, the privately held company is now the world's 14th-biggest retailer, with 1,200 stores in 12 countries and annual sales of $59 billion. True, that's small change compared with Wal-Mart's annual sales of $405 billion. But by many measures, Auchan is outperforming its bigger rivals in key global markets. Wal-Mart's "everyday low price" strategy has backfired with Chinese shoppers, who often assume cheaper products are unsafe or counterfeit. Make your own observation here. But Auchan's success is not limited to China. It is also the dominant Western retailer in Russia, by virtue of the fact that it's the ONLY major Western retailer in Russia. Wal-Mart and the UK's Tesco have no stores in Russia, while Carrefour opened two stores and then retreated. But will this "high quality" strategy work in the United States? In a sense, it's bound to, since any store that wants to rival Wal-Mart has to differentiate itself from Wal-Mart in some way. The failure of anti Wal-Mart groups such as the former Ontario Mountain Village Association (whose website, stopwalmartontario.com, no longer exists) is that they said that Wal-Mart was really bad - for example, all of their stuff was made in China - without differentiating between Wal-Mart and their preferred union supermarkets, which ALSO sold stuff made in China. The eventual successor to Wal-Mart will effectively position itself as a "good value" retailer, not a "cheap" retailer. Perhaps they'll claim to have knowledgeable staff. Perhaps their restrooms won't attract graffiti. And to make a profit, they certainly won't be discounting all the time. Which will result in a hue and cry from people who will miss the days of the good old stores like Wal-Mart, which provided affordable merchandise to the working classes, including low-priced prescriptions etc., and can't we just have our Wal-Mart back? I've previously stated my opinion that adding a social media presence to an unresponsive organization is like putting a lipstick on a pig. If your organization does not have adequate processes (either formal or informal) to address problems, then adopting a social media presence just because all the cool kids are doing it won't be worthwhile in the long run. But while an organization with a social media account has a responsibility to incorporate the account into its entire corporate structure, those of us who interface to an organization's social media account also have a responsibility to interface properly, and in the right way. @empoprises We hope you enjoy your stay with us! Please let us know if you need anything! So then Friday morning came, and I received my bill. And it contained errors, primarily related to special discounts and freebies that I should have received as a conference attendee, but did not. Now this message actually originated in FourSquare, which passed it to Twitter. From there it was passed to FriendFeed, and then went on to Facebook. So while bad news travels fast, good news travels fast also. However, the question remains - if the Hilton hadn't corrected my bill, would I have tweeted about it? It's hard to say, but perhaps not in this instance. But if a competing hotel (let's call it the "Richie") had engaged in some clearly fraudulent or life-threatening behavior, perhaps I would have tweeted about it. Maybe I wouldn't have received satisfaction from the offending entity, but I could have warned others about the problem. And that's the power of social media - a power that people like the sales director at the Hilton Costa Mesa clearly understand. OK, but I do have one tip - because the photos in the Hilton's Flickr account were not Creative Commons-commercial licensed, I was unable to reproduce any of them in this blog. In fact, the only Hilton Costa Mesa image with appropriate licensing is my own (license), so that's what I used (or re-used) in this post. The news comes - your company is being acquired by another firm. In many cases there will be a brief "business as usual" period, but eventually changes are going to be made to incorporate the newly-acquired company into the acquiring firm. Unfortunately, in many cases that reorganization includes something that is usually described with a euphemism, such as "right-sizing," but it basically means that people are going to be fired. But even if the reorganization does NOT include firings, it certainly will involve changes in the way that business is being done, with a corresponding change in what employees of the acquired company will be doing. In some cases these changes are minor, but in other cases they may be significant. After the reorganization is announced, there is usually a transitional period. If someone is being transferred from one job to another, the person usually can't drop everything he/she is doing that day and start the new job the next day. Perhaps the employee will ramp up on the tasks of the new position, while wrapping up some tasks associated with the old position. In addition, there is the issue of the timing of the reorganization announcement to those outside of the company, such as customers and vendors. When should the reorganization be announced to the public? Who should do the announcing? What key messages will be conveyed in the announcement? These are questions which each company will answer in its own way, and I can only share with you how my company dealt with this issue. For, you see, after 9 1/2 years as a product manager, I returned to the proposals department some weeks ago. However, I chose not to blog about this change publicly until now. Let's go over the list of things above and see how my company handled the situation. First, there have been no layoffs. When the potential acquisition of my division was announced a little over a year ago, the acquiring company took pains to emphasize that they were NOT interested in "right-sizing" or "increasing shareholder value" or whatever euphemism you want to apply. In essence, they needed people. However, once the acquisition was complete a few months ago, the acquiring company was now in possession of two divisions that pretty much did the same thing - our division, and a division that it had acquired back in the 1990s. Anyone could realize that this organizational structure would not persist forever. So various things were done in the months after the acquisition was complete - very little could be done before the various government agencies signed off on the acquisition - and a few weeks ago the new corporate structure was announced. I'll confine the discussion to my personal situation and note that this involved a transfer for me from the product management organization to the proposals organization. Although I had no knowledge of what was coming, the move out of product management was not entirely unexpected, and the move into proposals was not surprising. I had done some "what if" exercises in my brain, thinking, "If they move me out of product management, and if they don't fire anybody, where are they going to put me?" Because of my previous experience, proposals was a possible choice. In both cases, I fulfilled the commitments that I had previously made as a product manager, while privately communicating to various people (including key Oracle contacts last week, and key customer contacts this week) that my job duties were in the process of changing. As appropriate, I put my contacts in touch with the people who would be performing the relevant duties in the future. In the meantime, other private communications about the reorganization were taking place, but a public announcement of the reorganization occurred at this week's user conference, in which the customers in attendance learned about the new organization and about the heads of the new divisions within the reorganized company. And no, they didn't drill down to the proposal writer level, but if a customer happened to find out that I was no longer a product manager, that would not be surprising to them, given the breadth of the changes. Does this mean that I'll never listen to a PMV webinar again, or that I will quit tracking what IBM does with its Rational product line, or that I'll purge my mind of all of the acronyms that I've gathered over the years - since, due to my change in duties, I am no longer involved with the CCB, FEC, NSDB, or SEPG; no longer write MRs; and no longer read TRSes, SAUs, PSCMPs, or other CIs? Time will tell, since I have a new set of things to follow. Did you notice my Shipley post back on October 8? Perhaps you didn't know that I am reacquainting myself with some software (my first trip to the Union Square area wasn't for Oracle OpenWorld, but for some proposal software training back in 1999; we're still getting our proposal software from the same vendor). And I already have some new acronyms that are creeping into my vocabulary (WIP it into shape!). And frankly, even though I've written biometric proposals before, I still have a lot to learn. Let's face it - even though I was contributing to proposals throughout my years in product management, I haven't actually WRITTEN a proposal in this millennium. So in one sense I'm sort of "the old one" in proposals - I recognize some things in our proposal process that I actually created the last time around - yeah, I'm the "pink bold italic" guy. But I'm also at the same time "the new one," because our proposals team has made a lot of improvements in the past decade, so I've been catching up - pink bold italic text is now an official style! But I still have this product management experience upon which I can draw, both in my job and outside of it. So I'll probably yammer away on occasion about requirements and use cases and software development processes, at least until people tell me to shut up. But for now, I'm having fun. 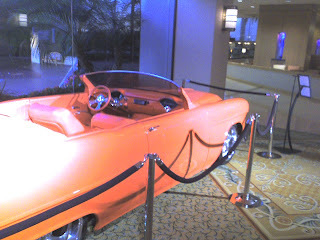 I'm at the Hilton Costa Mesa for one conference, but another one is obviously going on. And no, the FourSquare mayor can't drive it. I just scanned this blog to see what I've said about FourSquare, and I really haven't said much. Two posts, both of which were brief. I signed up for FourSquare after reading Robert Scoble's post in which he stated that FourSquare could become bigger than Twitter. I don't know about that, but it sounded intriguing, so I signed up. At first glance, I would appear to be outside of the FourSquare target demographic. I don't go out clubbing every night, and the few people that I know in real life who use FourSquare live many miles away from me (in some cases hundreds). Now perhaps it would make sense if I were going to conferences every couple of weeks, but I don't really do a lot of that either. But I do enough that I knew that I could give Foursquare a good workout. When I signed up for FourSquare in September, I knew that I'd be able to use it at Oracle OpenWorld in October. 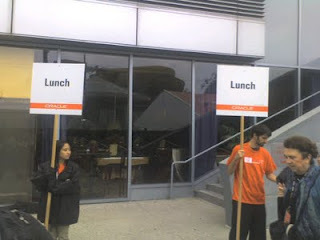 But even before I got to Oracle OpenWorld, I was exercising the service. I may not go to the trendiest clubs on the Sunset Strip (I haven't been to a club since Alexa's Wish broke up), but I go to Costco and Starbucks and places like that. And while the penetration of FourSquare in the Inland Empire isn't that great as of yet, that just means that there's more fertile ground to add new locations to the database. 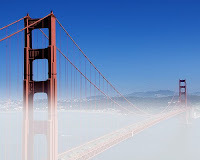 Then I got to San Francisco, and things got interesting. Jake Kuramoto is a FourSquare user (more on him later), and there are some others at Oracle that use the service. Yet some do not; at the blogger meetup at OpenWorld, Jake and I were talking to another Oracle employee, one who is dedicated to the use of social networks - yet FourSquare didn't personally interest him. I’ve been playing foursquare regularly for about a month now, and even though I was teased by several people (you know who you are) at OpenWorld last week, I’ll continue to play. 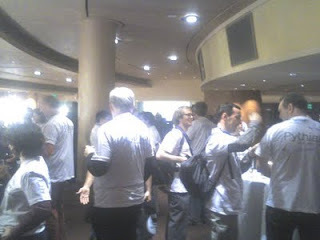 Foursquare was great fun at OpenWorld, and Rich and I chatted at length about its potential as a conference app. Because you can see all the people checked into a given venue, it’s one step better than Twitter, no need to announce where you are or poll for where your friends are. Maybe Marius and Tim can noodle on this for next year. We'd rather you not "close" any places unless they're bars / cafes' that have gone out of business. The exception is when people create venues for places that just don't exist - e.g. "Happytime USA", "I hate my boss", "On the beach" - those you are free to close. But as for all the other weird scenarios - people checking-in at subway stations, or on the Manhattan Bridge, or while on a Virgin Atlantic flight - let's keep them! 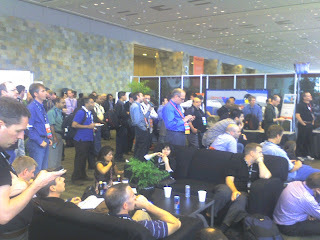 OK, now let's go back to Oracle OpenWorld 2010. Going a step beyond the check-in to Moscone South Room 104, you could have them check-in to Moscone South Room 104 for the Tom Kyte session. And you could have people put something on their FourSquare to-do list to go to the Tom Kyte session. And how could you populate that FourSquare to-do list? How about an export from a schedule building application? That's an idea to put in the mix. It is an amazing feature for consumers, and the advertising benefits for local businesses are huge. There is probably a very big return on those types of advertisements compared to more generic ad platforms. This also proves that there is a very solid business model for the mobile location applications. But what if my local businesses don't offer such deals? What if Garf's Sports Lounge doesn't give me free drinks even though I'm the mayor at the moment? It doesn't matter, because the game is still fun. And while I'm not an early adopter on this one, I guess I'm a middle adopter, for whatever that's worth. Incidentally, my FourSquare URL is http://foursquare.com/user/empoprises. And yes, Adam J, I see that you've gotten your Cafe Mason mayorship back. The airlines that added the most fees (for food, to check bags) in the past few months saw their revenues decline the most. Now perhaps a causation is being inferred that isn't there (see Jonathan Lewis' discussion of this), and there might be a third factor that is the cause of these correlated facts. But it's something to think about nevertheless. Let's face it - if it hadn't been for other circumstances, my last trip to Las Vegas would have been by bus rather than by plane. And that plane flight was with an airline that DOESN'T charge bag fees. Back on October 13, I wrote a post entitled "Where does innovative thinking take place"? Two ideas suggested in the post were "in the shower" and "in the car." 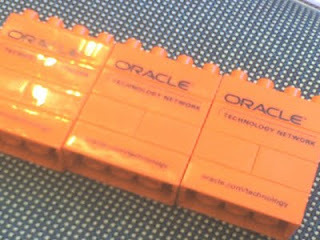 The next day, I wrote another post that talked about the Oracle Technology Network building blocks that I now have. And as you know, I took the building blocks on my current trip. But I haven't had any innovative thoughts yet. Maybe I should take them on a drive, or check and see if they're waterproof. I am currently at a conference sponsored by my company, at which users of our products attend to learn about the products they have, the products we offer that they don't have, and also about general trends in the industry. Obviously, my duty at this conference is to promote the use of our products. But I can't get full of myself while doing it. I was reminded of this on Sunday when I was talking to one of our customers. Like many of our customers, this one has had several generations of our product, which certainly indicates a certain degree of positive customer satisfaction. But the customer told me on Sunday that if he found out tomorrow that our software was going to be pulled out of there and another piece of software was installed, the customer would make THAT software work also. As is usual with the examples that I provide in this blog, this particular example can obviously be extrapolated to your situation. Let's say that you're a developer who has created a third-party solution based upon Twitter, and let's say that for some reason you're unable to use the Twitter API any more. Unless your business plan is extremely myopic, that doesn't mean the end of the world. It's possible to take your application and use another platform for the underlying communications. Twitter not working for you? Use Facebook. Facebook not working? Use MySpace. Conversely, let's say that you are a service provider who dominates your particular industry, and while a few people hate you, a lot of people love you. Does this mean that you can rest on your laurels because you have the market locked up? If you believe you can take it easy, take a moment and talk to people from Friendster, or CompuServe, or K Mart, or A&P. Change happens, and someone can always find a better tool. I've been catching up on my blog reading, and I wanted to comment on a blog that I enjoy. I wrote my comment, and then got to the CAPTCHA, which had several letters, some dark, some light, and the light characters seemed to be near-duplicates of the dark characters. Oh, and the CAPTCHA required that you "respect" case when you entered the CAPTCHA. I took my best guess - and failed. I actually took my best guess several times - and failed, and my comment was queued for moderation. Now to be fair, the site might have intentionally implemented tough CAPTCHAs to encourage people to become members of the site. But I'm a member of enough sites already - if I didn't join Digg until it became available via Facebook Connect, I'm not about to join a standalone blog site. Gerald Weber of Search Engine Marketing Group (this time, in a dated post from December 27, 2008) points out that this practice could potentially harm you. As business owners, bloggers and/or search marketers, we all go through pain staking efforts to get qualified traffic to our websites from the SERPS, Paid search and our various social media outlets. However all this effort and hard work may be in vain if our users are not able to easily fill out our contact form(s). Sure the CAPTCHA (Completely Automated Public Turing test to tell Computers and Humans Apart) or as I like to call it CPA (Complete Pain in the A**) is intended to solve a valid business problem, but at what cost? Should we really make customers/prospects work this hard to contact us? Not to mention by using a CAPTCHA you will be alienating multiple groups with disabilities i.e. blind people and people with dyslexia. Please don’t make me work as if I am trying to crack a security code for the computer banks at NASA! I am not one of those people who lives in constant fear that the FBI and the CIA and the BBC, B.B. King, and Doris Day are all going to conspire against me in a Big Brother sort of way and exchange secret data about me to be stored in the Brussels supercomputer. Why am I not afraid of this? Because I grew up in the Washington, DC area, which taught me that government agencies don't LIKE to cooperate with each other. And even after I moved away, I haven't seen anything to change my view - especially when I've been to meetings where two people from the SAME agency were sniping at each other because they were from different departments. Federal intelligence officials have decided to shut down a Web-based, unclassified e-mail system, sparking debate within the intelligence community about whether the move will hamper collaboration. Sounds like a laudable effort. What happened? ...but it's unclear exactly what security issues were considered troublesome. One former intelligence IT official blamed bureaucratic thinking, rather than security, as the cause of uGov's demise. "Security had nothing to do with this," he said. "You have people saying, 'We really don't need this. Everybody has e-mail. Why not just kill it?'" OK, here's what really happened, at least until someone proves me wrong. Sarah Smith was a GS-14 IT professional with the Comprehensive Analytics Division of the National Agency for Secure Technical Implementation, or NASTI. (I think she's a consultant now.) But about a year ago, her boss called her into a conference room in which three other people were present, including an Office of Management and Budget (OMB) person who was the uGov representative. As Sarah entered, her boss introduced her to the assembled people and stated, "Sarah Smith is the sharpest person in this unit, with a thorough knowledge of TCP/IP, HTTPS, and TQ-8QF. I am assigning her to be the coordinator and interface of the NASTI uGov Improvement Project 2008, or NUIP8." After some additional conversation, the meeting adjourned, and Sarah went to her boss' office. "First, what is TQ-8QF? I haven't heard of that?" "I made it up. You understand what you're supposed to do with this uGov thing, right?" "Bury it. I don't pay you to work for other people's problems. Work on our own systems and blame the other agencies for the uGov failure." Another week, another conference. 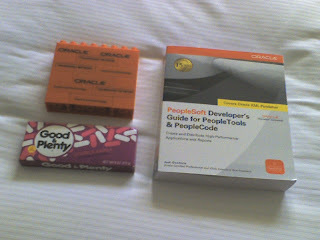 But I brought some things with me from my last conference, Oracle OpenWorld. You can see my prize, a/k/a the book that will make me a PeopleSoft expert (#pexp), plus my OTN building blocks. If you follow me on Foursquare, you know where I got the Good & Plentys. What do we want? Broadband! When do we want it? When our reindeer steaks are ready! Good...um...timing. We are currently being visited by a houseguest from Finland, and when she returns back home, she can prepare for the day when she can exercise a basic human right. Come July 2010, every Fin will have access to a 1 Megabit-per-second broadband connection. Finland just became the first country in the world to sign a law that provides every citizen of the country with a legal right to a broadband connection. But the Finnish experience may not necessarily extrapolate to other areas, since Finland has high urban concentrations compared to, say, the United States. 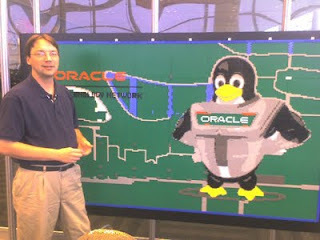 During Oracle OpenWorld, I participated in three interviews, shot two videos, and did some other things here and there. Oracle has chosen to publish one of the videos on its YouTube channel. There's actually another Oracle video of me floating around somewhere; I'll have to go dig it up. I normally don't write a ton about my day job here, but at some point (once I've had a chance to catch my breath), I'll try to write a little bit about some of the 11g technologies that I mentioned here. United would not let me board an earlier flight because it was too late for them to find my bag. 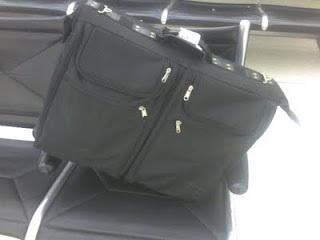 Of course, as I suspected, the BAG made the earlier flight and has been sitting here for four hours. Well, I was joking about it for a while, especially based upon things that have happened here at Oracle OpenWorld (for example, I am typing this on an Oracle-supplied laptop manufactured by Lenovo), but now the stakes got a little higher. Not a lot higher, but a little higher. You see, the Oracle Technology Network (which, at last count, has supplied me with three beers, two cookies, and one Red Bull) held a drawing today for various Oracle Technology Network items. And I just won a prize. Now the grand prize was a Flip camera, and the other prizes were technical books. This is, after all, the Oracle Technology Network, where even the toy giveaways serve a technical purpose (the building blocks subliminally emphasize Oracle's stack, after all). Now I was interviewed earlier today (you see, I don't spend all of my time playing with toys and sitting in bean bags), and the interviewer asked how much of the Oracle stack my employer uses for the biometric products that we deploy. While there are some portions of the Oracle stack that we could use, but don't, there are portions of the Oracle stack that really provide no benefit to our customers. When you're a cop and you want to know whether two biometric samples match or not, some of Oracle's higher-level applications just plain don't make sense to you. So with that in mind, I will tell you what I won: Judi Doolittle's PeopleSoft Developer's Guide for PeopleTools & PeopleCode: Create and Distribute High-Performance Applications and Reports. Which, incidentally, "Covers Oracle XML Publisher." Now this is not the first time this week that I've been pretty much out of my depth. I've already blogged about how I would clearly lose in a battle of wits with Daniel Morgan, and I tweeted about how I would clearly lose in a battle of wits with Jonathan Lewis. And I think that I would lose wits with many of the 40,000+ people who are here, including Roger Daltrey and Shooter Jennings. But at least I'm not alone. When Arnold Scharzenegger participated in the keynote speech today, he made a point of mentioning the intelligence within Moscone North Hall D, and how his IQ was raised ten points just by being there. When you're around people that know things that you don't know, your IQ - or, more accurately, your store of knowledge and your thinking and comprehension skill - IS going to be raised. And it goes both ways. I bet that if Tom Kyte hung out with the Governor, Kyte would learn things about bodybuilding, the movie industry, and politics that he didn't know before. And I probably have some understanding of biometrics and procurement that some of my readers may not have. Perhaps this suggests something that I should do more - namely, investigate something that I know little or nothing about. While my formal education officially ended when I received my MBA in 1991, that's obviously no reason to shut my mind off completely. I don't believe that I've shut my mind off completely, but perhaps I could do a bit more. Oh, and FTC investigators, the list price of this book is US$69.99, which is more than all four Empoprises blogs have earned in advertising revenue. And, as Larry promised, PeopleSoft will be supported for ten years, although that doesn't mean that 8.9 per se will be supported. 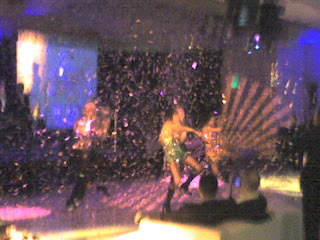 From OTN Lounge at 4:35 (speech scheduled end time was 4:30). FTC DISCLOSURE: I DID NOT PAY FOR THESE BUILDING BLOCKS. AND I DID NOT PAY FOR THE TWO BEERS FROM THE OTN-SPONSORED BLOGGER MEETUP LAST NIGHT. THE BEERS THAT I CONSUMED WERE FROM MEXICO AND THE NETHERLANDS; BOTH COUNTRIES ARE CUSTOMERS OF MY CURRENT EMPLOYER. AND I'M TYPING THIS ON A PHONE MANUFACTURED BY MY FORMER EMPLOYER. I DON'T KNOW WHO MANUFACTURED THE CHAIR I'M USING. DID I FORGET TO DISCLOSE ANYTHING? 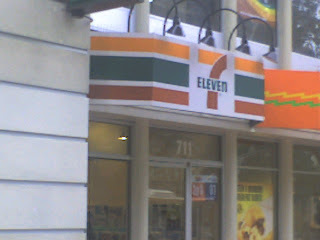 The 7 Eleven on 711 Market, San Francisco. A little over a year ago, I wrote two posts about the Large Hadron Collider that will shoot things really really fast and smash them. You'd think that this was a guy thing, but as I noted in the post, one of the people associated with LHC at the time was Dr. Verena Kain. I haven't really kept up with the LHC in general or Dr. Kain in particular, but I did learn that one person is no longer working on the LHC project. According to French newspaper Le Figaro, judicial sources point that the man—who has been working as a particle physics contractor since 2003—has links to Al Qaeda groups in the Islamic Maghreb. Le Figaro said that he had suggested terrorist targets in French soil. Meanwhile, the non-terrorist portion of the LHC project continues to...have meetings. Puccio, Stefan Roesler, Jan Uythoven, Walter Venturini Delsolaro, Jorg Wenninger, Simon White, Frank Zimmermann. Excused: Reyes Alemany, Massimiliano Ferro-Luzzi. With crossing angle: only one polarity of LHCb spectrometer possible (for any β*). I'll take their word for it. 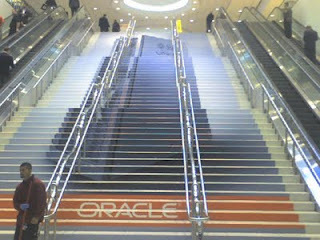 Oracle Exadata V2 (with Sun) on the stairs of Moscone North. Facing in the opposite direction from the Oracle Exadata V2 picture I took previously. I didn't blog a lot about my activities yesterday (mostly database-related), but I'm at the connection center on Moscone West's third floor at the moment, which gives me the opportunity to share two nuggets of wisdom that I picked up today - one on the way to Moscone West, and one after I arrived here. The latest weather reports indicate that Marius' hopes (which directly impact the Appreciation Event on Treasure Island) will be fulfilled. But he said nothing about Tuesday, and when we all woke up on Tuesday morning it was pouring. Pouring on a day that I didn't bring my umbrella, I slept in late, and I wanted to catch Daniel Morgan's unconference session on Oracle Database 11gR2. And I figured that 40,000 people were in the same...um...boat, and that the buses would therefore be packed. So what did I do? I went to a nearby Starbucks, bought today's New York Times, and stuck it over my head as I fast-walked to Moscone West. my #oow09 umbrella this a.m. courtesy new york times. score 1 for print journalism! Because, let's face it - whatever we may think of the AP and the WSJ and the RIAA and the BBC, B.B. King, and Doris Day, my insightful and witty repartee in Empoprise-BI and the other blogs in the Empoprises empire is not going to keep you dry during a rainstorm. The New York Times did. So there. As is usual during the Unconference sessions, and even during the general sessions, much of the information went over my head. In case you didn't know, I'm a product marketer, not a database architect. So when Morgan mentioned Data Pump and SecureFiles, I could nod my head in understanding, but when he got into specific SQL commands and packages and stuff, I was glad that I wasn't being quizzed on the material. In fact, Morgan said that he actually feared the people who were still stuck in 7.3.4 mode. Needless to say, this doesn't only apply to adoption of database features. While I readily admit that I am not trendy, that doesn't necessarily mean that I'm a complete Luddite. While adoption of a new technology should clearly have a benefit (one doesn't just adopt new technology for new technology's sake), you should definitely adopt a technology if that benefit is clear. And if you're avoiding the technology, you need to have a good reason why. I'd be willing to bet that 99% of the people who are truly expert in Oracle databases would agree that Oracle Database 11gR2 offers clear benefits over Oracle Database 7.3.4. And that the latest version of Excel offers clear benefits over the first version of VisiCalc. And that a Honda Accord offers clear benefits over a Model T.
So my question to the readers of this post - are there cases in which it is NOT beneficial to adopt a new technology, even if the new technology offers clear benefits over the old? On Saturday, Chris Brogan shared fourteen suggestions for people who want to blog daily. Many of Brogan's ideas had to do with getting inspirations for blogging. His first one? "Read something new every day." Well, I read his post, and it proved to be the basis for this post. Take a shower every day. Seriously, sometimes you can get excellent ideas when you're taking a break from work. Now I just need a waterproof pad and paper (your idea number 3). About a year ago I quit listening to the radio in the car. And I am always amazed how my mind starts to really focus on things that I don't otherwise think about while doing other things. But I think that's it, I'm doing other things. In the car, not so much. That same day (Saturday) I engaged in thinking while driving, although I certainly wouldn't call it innovative. By midday I thought that I was completely packed for my Oracle OpenWorld trip, but when driving (without my darling) on Saturday evening, I realized that I had forgotten to pack my mesh laundry bag. Not necessarily an innovative thought, but I would have needed to innovate if I had forgotten it, I guess. The common factor in showering and driving is that these activities only use certain portions of your brain, freeing other portions of your brain to do other things. What portions do what aren't clear to me; I'm not an expert on the brain, and this excellent description of the parts of the brain doesn't go into enough detail to biologically identify the part of the brain that creates innovative thoughts. vs. the part of the brain that turns on the right turn signal or grabs the shampoo bottle. But other people have discussed the connection between driving and innovative thinking. Lemelson-MIT Program Director Merton Flemings notes that the uninterrupted solitude of vehicular travel creates a fertile breeding ground for innovative thought. "Many Americans feel they spend half their lives in cars, but we were surprised by just how many people felt their daily commute was conducive to creative thinking," he said. "But when you stop to think about it, it makes sense. Daily commutes in this country are getting longer each year and the car may be one of the last environments in which we can escape from our over-stimulated lives and just be alone with our thoughts." A noted inventor who holds 26 patents, Flemings was traveling alone on the Massachusetts Turnpike when he suddenly formulated the basis for his most important discovery – a greatly improved process for producing lightweight metal parts that are used in airplanes and, of course, cars. 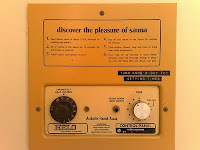 [T]wo wildly popular settings – "watching television" and "listening to music" – placed at the very bottom of the results with meager 1.6 percent and 1.0 percent figures, respectively. Frankly, however, I'm curious if the TYPE of television or music might merit more consideration. I'm willing to postulate that certain types of television (science fiction) and music (ambient) may be more conducive to innovative thought than other types. Or perhaps you should just sing in the shower. Hey, it launched Bill Murray's career. What do we want? LUNCH! The LEGO will be complete by Wednesday. Moscone West, 3rd floor. Harshbarger has been doing this professionally for a decade. Outside of Moscone North Hall D. One year Larry Ellison's boat was in this spot - something that bent one national tech correspondent out of shape. Presumably this pleases her more. 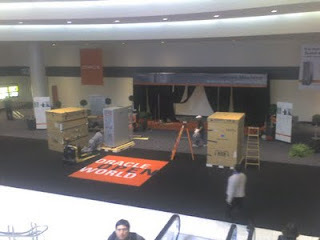 My first day at this year's Oracle OpenWorld has come and gone. Due to fog at San Francisco International Airport, my flight out of Ontario was delayed almost two hours, which meant that after arrival, hotel check-in, OpenWorld registration, and OpenWorld goodie pickeup (backpacks were a nice touch this year, and the alumni jacket will come in handy), I didn't get to the Oracle PartnerNetwork sessions until 3:00 pm. And, to tell the truth, I didn't stay for all of the OPN stuff, opting to head back to my hotel room to listen to Scott McNealy online before grabbing dinner at Cafe Mason (yes, I skipped Howard Street last night; plenty of time for festivities later in the week). For me the chief takeaway from memory lane wasn't McNealy's trip down memory lane, or Larry Ellison's "we were fined by TPC for releasing results too early, so now eat the real results, IBM" speech. I was more impressed with something that I heard during the Oracle PartnerNetwork session...and it isn't even something that I can use. After hearing several people at Oracle speak about several programs for partners, Dale Weideling brought Mark Hall to the stage. Hall is not with Oracle, but with a company called Rational Markets, and he stated that we Oracle partners were the first public audience to hear what he was about to say. Based upon his experience with Chief Information Officers (he headed the CIO Executive Council at one point), Hall stated that their number one pain point was that the timing between buyers and vendors was all askew. When a CIO is in the market to get something, the CIO has difficulty finding something who offers what the CIO wants. But when the CIO isn't in the market for anything...that's when all the vendors show up. Hall then looked at it from the vendor's perspective, and the vendor's desire to find an opportunity right when the purchaser is ready to go into the market. The common way in which valuable sales opportunities are identified is via a sales funnel. If you're not familiar with the sales funnel, it is a model in which a number of potential sales leads are evaluated, and "funneled" down to one or more real purchasers who will actually buy your stuff. Hall compared the sales funnel to a meat grinder, and noted that the whole thing is "massively inefficient." ...a breakthrough community of CIOs whose mission is to establish a new working paradigm between enterprise IT buyers and sellers. Large amounts of specifics weren't provided during the OPN presentation, other than to note that the buyers can maintain their privacy until they choose to reveal their identity. I guess that helps to remove the pester factor so that CIOs don't have to be bugged by sales reps all day. When you think about this, it also benefits the sales reps, since you can't waste time cold-calling leads if you don't know who they are. Whether Rational Markets will attract enough business to stand the traditional funnel model on its head remains to be seen. In my case, my products are sold to government agencies who conduct standard open procurement processes, so Rational Markets wouldn't really benefit me, it seems. Still, it's an intriguing idea and worth following. Oracle and Sun were able to set the world record using eight times less hardware than IBM used for its largest benchmark (3). The Oracle-Sun configuration consumed four times less energy than the IBM configuration even though it ran 26 percent faster. The Oracle-Sun benchmark demonstrated 16 times better transaction response times than the IBM benchmark(4). Oracle Database 11g running on the Solaris™ 10 Operating System achieved a record-breaking 7.7 million tpmC at $2.34/tpmC. (1) 12-Node Sun SPARC Enteprise T5440 server cluster 7,717,510 tmpC, $2.34/tpmC, available 12/14/09. (2) IBM Power 595 Server Model 9119-FHA, 6,085,166 tpmC, $2.81/tpmC, available 12/10/08 (Best IBM DB2 TPC-C result). (3) Hardware size measured in racks of equipment as priced for the benchmarks. (4) Based on average response time of New Order transaction in TPC-C benchmark. (5) HP ProLiant ML350 G6 server running Oracle Database, 232,002 tpmC, $0.54USD/tpmC, available May 21, 2009. But the Oracle press release didn't get around to recording Scott McNealy's comments during the keynote, in which he went after everybody, even zinging Ellison himself at one point by noting that Ellison could have done better marketing when talking about the future of Java. Well, Monday promises to be a busy day, beginning with an important 8:00 meeting and ending with an important reception, with several database sessions in between. 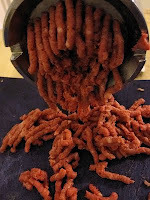 Hopefully I won't feel like I've been through a meat grinder by the time the day's over.